This frontispiece of Jan Swammerdam’s Tractatus is, in fact, a key to the contents. Page numbers in the image highlight where in the book certain experiments are described. For example, page 58 shows a dog with a thermometer on the right to measure the temperature of blood that has passed through its lungs. The image assigned page 20 refers to the experiment of a dog breathing under water with a tube in its trachea. The incongruous drawing at the bottom shows two snails copulating and refers to Swammerdam’s discovery (p.114) that the snail is a hermaphrodite. 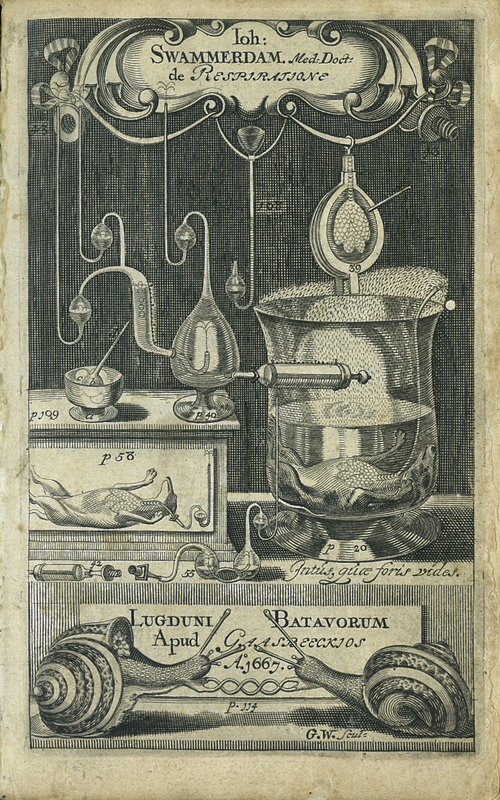 Jan Swammerdam, “Tractatus Physico-Anatomico-Medico de Respiratione Usuque Pulmonum,” ourheritage.ac.nz | OUR Heritage, accessed April 22, 2019, http://otago.ourheritage.ac.nz/items/show/11088.